At Wills Toyota, we sometimes see cars that make you want to jump in and drive them. 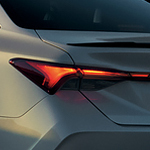 The 2019 Toyota Avalon is one of those cars. It looks like it's moving even when it's standing still. We think you'll agree. The 2019 Toyota Avalon looks just as good from the back. The dual exhaust with quad chrome tips continues the sporty look that defines this sleek sedan.